The Rotterdam World Gateway (RWG) terminal, a project of DP World and its partners, which has capability to handle the largest container vessels afloat in the most efficient and reliable way thanks to its innovative character, has officially opened. DP World, together with joint-venture partners APL, HMM, MOL and CMA-CGM, said the new facility provided the supply chain with the most innovative and automated container terminal in the world. “With dedicated handling facilities for road, rail and barge and extensive automation on site, RWG looks very different to a traditional marine container terminal,” a statement marking the opening said. “The high level of automation at the terminal brings benefits for RWG when it comes to safety and sustainability. These are two areas in which RWG is leading the way. Innovative concepts result in shorter distances for internal terminal transport and less equipment on the terminal. With fully electric cranes which are powered by 100 per cent green energy and generate their own power, RWG is setting new standards in the industry,” it added. 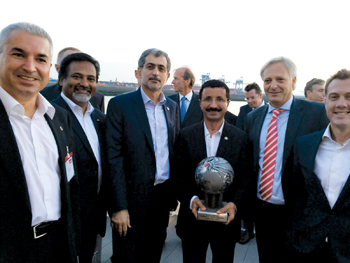 DP World chairman Sultan Ahmed Bin Sulayem, who attended the opening, commented: “Rotterdam World Gateway promises to provide an unrivalled level of automation and customer service and brings a new era of technology and modern efficiency in container terminal operations. The ease of connectivity between container vessels, barges, road and rail is a vision of how the future can look in our industry. Present at the ceremony were the Mayor of Rotterdam, Ahmed Aboutaleb, RWG managing director Ronald Lugthart, RWG board of directors chairman Rob van Dijk and Port of Rotterdam Authority CEO Allard Castelein. With a current capacity of 2.35 million teu, RWG is ready to handle the newest generation of ultra-large container carriers (ULCCs) and the future generations to come. The facility has eleven deep-sea cranes, three barge/feeder cranes, two rail cranes and 50 automatic stacking cranes which provide access to both deep-sea vessels and all hinterland connections.